Manufacture: AGAT Clock Factory. Case: Stainless steel, hand crafted. Dimensions: 75x70x18 mm. 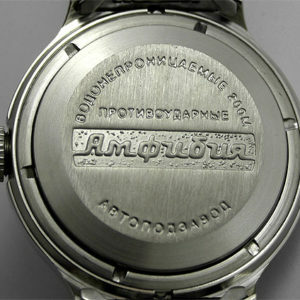 Case diameter: 60 mm. Weight: not more than 0,26 kg. Dial: Black. The digits on the dial are covered non-radioactive luminous mass. 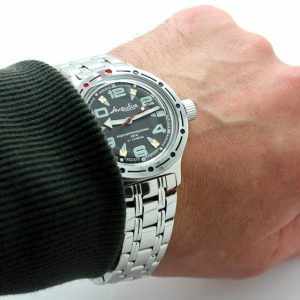 The movement: Mechanical hand wound Vostok 2409 movement with 17 jewels. Functions: hours, minutes. Shock protection. Water Resistant 100 meters. Daily rate from -20 to + 40 s/day. Power reserve: 44 hours. Condition: Brand New. Warranty: 24 months. The watch comes with original rubber strap, Russian papers in original wooden box.